From National Park we made our way north to Rotorua, hoping that the NZ Kayak Buyers Guide & Cumec Magazine would be finished printing. 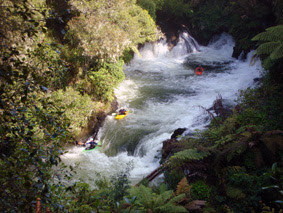 After discovering that it was still at least 4 days away, we quickly made our way to do the 1st of many runs down the Kaituna River. 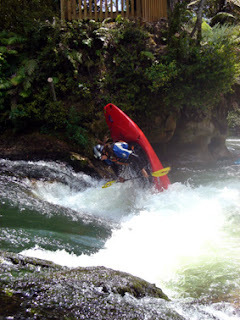 Megan had never paddled the Kaituna before so she followed me down. 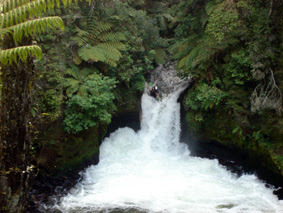 Tracing my lines through the 1st few rapids and then over Okere Falls (about a 2m drop). The river thens drops into a weir created by the old power station with the safest line being a boof hard right into the eddy. Just down stream lies Tutea Falls 7m after briefing Megan on the line, I set off paddling left to right and boofed off the falls, landing on the pillow and being pushed out in to the pool. I turned to see Megan boof out from the drop land nicely and flip off the boil, she rolled up and had a big smile. Her 1st big waterfall. Although she had her eyes closed the whole time to keep her contacts in place. We managed four runs on Saturday, including a couple of decent play sessions at bottom hole. Also tried out the new Bliss-Stick Mystic for 1 run down the river.